Donald Trump and his beautiful (and obviously smart) wife have revised the AAP vaccine schedule for their son, Baron. I wonder how many peds tossed him/his wife out on their behinds when they asked for a change in the vax schedule as has happened to so many of us? I'd hazard a guess that a large part of Trump's financial success comes from his ability to correctly assess risks and benefits, wouldn't you? Looks like he's done that for his child's health too. Bravo! "The Donald is no stranger to strong opinions, whether he's trading barbed comments on network television with Rosie O'Donnell or dispatching the latest contestant on The Apprentice. 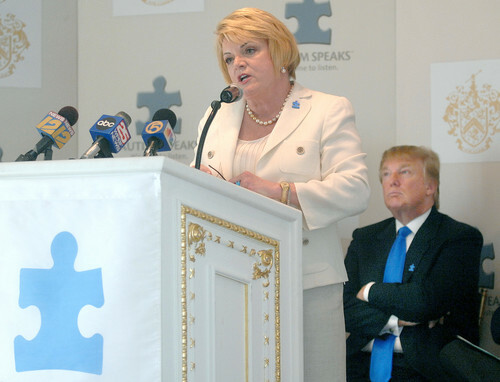 In an interview with Palm Beach Politics, Donald Trump offered a controversial opinion on a new topic: autism. The New York-Palm Beach real estate mogul is no doctor, but he said he thinks the rising prevalence of autism is related to vaccinations given to children at a young age. Autism now affects 1 in 150 children, a sharp increase from a few decades ago. But whether vaccinations have anything to do with it is passionately debated, and many dismiss the notion as a conspiracy theory. Amid Mar-A-Lago's perfectly trimmed lawns and blossoming bougainvillea bushes, the press conference was held in typical Trump style: in a gold-trimmed ballroom, as moneyed guests at his waterfront compound splashed in an adjacent pool. Referring to his and his wife Melania's 22-month-old son Baron, Trump continued: "What we've done with Baron, we've taken him on a very slow process. He gets one shot at a time then we wait a few months and give him another shot, the old-fashioned way. But today they pump the children with so much at a very young age. We do it on a very, very conservative level."" Kim Stagliano is Managing Editor of Age of Autism. She's a writer, Mom to three girls with autism, blogs for Huffington Post, has her own blog HERE. A minimal Maybe 3 or 4 required and spaced far apart. For Vicki; about 5% of autism is genetically based; a genetic syndrome called fragile X, also agenesis of the corpus callosum. Encephalitis is a known vaccine injury; it means inflammation of the brain, and can cause seizures, brain damage, and autism type behaviors. As John Stone says though, I too find it surprising that you argued with doctors from the day your child was born, ( Hep B vaccine) ,maybe got kicked out of the physicians practice, dealt with online cruelty and villification, still haven't vaccinated, but spend your time posting pro vaccine statements. Vicki. Although there may be other causes of autism, for those of us with family members who saw their children/grandchildren regress immediately after vaccination, you would have a difficult job convincing us that it was from another cause. However, you may be interested in the Highwire video from yesterday which shows that GMOs/glyphosate may be contributing factors. Giselle, My son was in his 20s when his son received the MMR vaccine. He (my grandson) was rushed to the Doctor with adverse reaction that same day. He never spoke again and is now 26 and requires 24/7 care. If what you say is correct, all children with an autism diagnosis should have old parents. This is certainly not the case. We get many almost identical comments of this kind. I don’t think it is particularly incredible that there may be non-vaccinated cases of autism: what I find incredible is that someone who has not vaccinated would post in favour of vaccination - also that there are lots of people so motivated. Vaccines do not cause autism. Stop spreading dangerous conspiracy theories. Trump’s son is autistic because old father have a higher chance of having autistic children. Genetic mutations in sperm that occurs on each decade of a man’s life. Trump wants to blame something else while he’s the cause, as usual. So he became an anti-vaxxer kook. What if it is caused by maternal low vitamin D? And borderline low thyroid? And a baby born to a mother with those 2 problems is not resilient, and when you pour in the vaccines, they are helpless to clear and metabolize them out of the body and that accumulation causes the damage and autism? prenatal vitamins frequently lack iodine, pregnant women are afraid to eat fish while pregnant and that means a low iodine count and the human body makes thyroid hormone form iodine. what about the 85% of people in USA who are sunlight deficient? In Sweden the off spring of the Somali people living there and a much higher rate of autism then in their native country. How sunlight deficient is Barron because even in autistic children function improves with a higher vitamin d level. How much sun did he his mother get living in Trump tower during her pregnancy? she looks tan but I think it is artificial. Why all the vaccines??? My children got only a few: immunisation against TB, polio, measles, German measles and whooping cough. That's all. Those were mandatory inoculations. They grew up to be healthy and strong men with no problems at all. I put up a link at Age of Autism in November to a video showing that Barron Trump has autism. I wanted to send it to a friend last week, but found that the video had been taken off of Youtube. I looked for it, and found it under another name. I linked it to Dina, and she agreed that yes, the boy has autism. I was going too put it up here again, as the subject is brought up again, but just found that the video at the second link has been taken down as well, since Monday, said to be for violating Youtube's terms of service. I don't think this is reasonable. It is not a source of shame for anyone but the vaccine industry that Barron, like my daughter, like millions more, has autism. It is very important that we talk about this, very important that even the president has an autistic child. Sort of like the video of the autistic boy kidnapped in Chicago: someone said that his family has a right to privacy. I don't agree. It is very important that everyone experience and think about what these events mean: they transcend the private sphere, addressing very important questions about racism, vaccines, and autism affecting millions of Americans. I noticed that the kidnapping victim's family only said he had schizophrenia and ADD. I heard him say "Why you do this?" to his tormentors in the video. His language was limited, not that of someone who "only" had schizophrenia or ADHD. Apparently his family thought it was preferable to be considered schizophrenic than autistic. Why would that be? Why would autism have become a scarlet letter? Is this another strategy to conceal the dimensions of the tragedy, by trying to make it something shameful to recognize or talk about? He was on the right track, but unfortunately Barron reacted to one or more vaccines with autism. While Trump is right that it's ridiculous to give so many so soon, with one size fits all doses, Trump is mistaken to think that slowing down the schedule would be enough to solve all the problems. It would work for some, but for others it's the large number of vaccines given as much as the early age or the several given at once. Others react to their very first and only vaccine. I reacted to the first DPT at three months with days of screaming and Asperger's. My baby reacted to the hep-b vaccine at less than 24 hours old with days of screaming and autism. Would she have done better it the hep-B vaccine had been delayed? I don't know and don't care. It's a foolish vaccine to give to any child born to an uninfected mother, but three doses of it are on the list of recommended vaccines. There is no such thing as a safe vaccine, and I say that even though I would be cautiously willing to get some, like the DT series after two years old. But everyone must make his or her own choice on that. I would love to say I agree with this but my child was autistic b4 he received his 1 year shots. I saw the signs b4 that. Everyone may not see them but they're there. Some kids may be prone to certain things and some may not. My two other kids do not have autism & they all received their shots from the same place and doctor. So this is not 100% correct. autism is being diagnosed somewhere around 1 in 50, not 1 in 150. Love love love my pediatrician let me do this with my daughter bc our son has autism and our pediatrician understood because he has a son with Asperger's syndrome. We are not anti vaccine just smaller doses over an extended period of time. I'm glad finally someone as high a level as our next president. And for all you Na Sayers what could it hurt to slow the process? Until they can prove what causes autism I will continue to believe this and that it is a cover up. Our government and the CDC will never admit fault because of all the lawsuits they have imagine how many children are now affected by autism and how many services and doctors visit, medications they would have to pay if they admitted fault. Call me crazy if you want but I live with it everyday as does my beautiful son and I saw first hand the change in him after receiving a vaccine. Thank God for a great leader, with President Trump & his amazing wife, Melania, stopping the NWO agenda. It is so disheartening that there are so many brain washed sheeple out there/ along with big Pharma & the Corporations fighting for their "secret agenda" of destroying lives & making millions of dollars while doing it. Devoid of any concern for humanity. I NOW HAVE RENEWED HOPE OF RESTORING AMERICA TO A CIVILIZED SOCIETY, WITH RESPECT & HUMANE TREATMENT OF PEOPLE & ANIMALS. Trump's not brilliant. I appreciate that he's spoken out in vaccines, but whether he actually does anything remains to be seen. He's facing 75 lawsuits and may be impeached. I'm sure the Republicans would rather have Pence as president. So far Trump's transition team and people being considered for cabinet positions don't show any signs of the "change" that he promised. And I agree with Greyone who asked, "Why is he silent on the whistle blower... And where's his objection to mandates?" If anything good comes of this I'll happily eat my words. I look forward to the day where people not only space out and reduce their kids vaccines........ but altogether eliminate them and instead stress healthy food and living.... and allowing their kids to catch and then conquer these childhood diseases that have been rendered largely toothless by knowledge of how to treat such illnesses. I look forward to the eradication of the vaccine paradigm, which only imputes a lower and temporary immune threshold to our children..... not the stronger lifelong immunity that God intended for us to have. I hope he can change vaccine schedules for all children. One at a time and not any until they are at a safe age. Look at how quickly we have gone from 1 in 150 children with Autism to 1 in 45, 1 in every 25 boys! What has changed so rapidly? The number of vaccines have risen to 74. Now 1 in 18 toddlers are diagnosed with Autism. Autism is merely a code word for Brain Encephalitis from the Aluminum, Thimerosal/mercury, formaldehyde, allergy causing peanut oils, ether and other toxins shot into children for Money! I have now become a one issue voter. Thank you for saying this out loud Mr.Trump. I appreciate that you aren't owned by the pharmaceutical companies, like Carson. Why is he silent on the whistle blower. He should be calling the media's attention to it. And where's his objection to mandates? And this alone could get me to vote for him and campaign for him. My father is voting for him on this alone. And he's a life long, born and raised UAW Democrat. We are college educated, know how to read inserts, court cases, toxicology, chemistry, pharmacology, etc. Vaccines do and can cause autism. Hear Us Well (them). an infant is born prematurely by C section, or is low birth weight or in respiratory distress? It does not matter MD's give the order to vaccinate to meet the CDC's mandate. What the Who.org Sales Plan says, " Buy and sponsor our vaccines to secure shared profits." It is their intention to initiate laws to force vaccinations at the Congressional and State and Heads of Countries and to focus on middle income families. It's about keeping this trillion dollar industry making trillions. Drug Lobbyist continue to buy Congressional and State Reps to hide the hidden death dangers... like peanut oil,mercury and aluminum, and questionable additives and preservatives not listed on the white paper insert. Vaccine manufacturers and MD's have an exemption. It does not matter what they put in vaccines. CDC and the FDA are guilty of lies to keep the money trail and blame from them. Fed Up CA Moms are out in force Recalling the CA Senator-Doctor and 25 other State Reps who received dollars from Merck to allow MD's to target young 12 year olds and is adding it to the School Schedule, and the CA Medical Association to do their bidding, he also rigged votes and fast tracked the Forced Vaccine Bill to take away Parental Rights and Religious Exemptions and blatantly violated what's left to the Constitution. A Referendum, the People's Veto is underway. Ian Jacklin film maker, he produced iCureCancer Documentary about Natural Doctors and patient who have healed themselves from cancer;without chemo, radiation, and surgery and now producing Baby Killers showing how how toxic vaccines are killing our babies in America. Donations are accepted. www.ICureCancer.com. YouTube.com for trailers and training on how to do the Recall and Referendum in CA. (Donations are accepted). Thank you for standing up for us Donald! I was hoping someone rich, someone the media would have to (like to) listen to would speak up against vaccinations. Well, here he is. I am grateful for Donald Trumps willing to buck against the machine on this subject mercury and now aluminum in these injections are neurotoxins there is no reason to believe that since they are part of a vaccine that they suddenly stop being neurotoxins. Thank you Donald. The truth is appreciative of your support. Bold, courageous statements by individuals like yourself with the integrity to stand up against the midst of this smokescreen is what is required to bring an end to this historical madness. I agree Gina. This atrocity will go down as the worst medical blunder in the history of mankind, guaranteed!!! For those that wish to have their children in public schools, or private pre-schools, there are vaccine objection procedures. Contact your local Public Health Office. The school itself may object, and you may want to look at another. I would put a note in with your form when you turn in the application, saying how much you love your kids, and how you want them to not experience the hardships their sibling has endured as a result of vaccine injury. If they show no compassion, or turn you away...you don't want your kids there anyway! If religious exemption is all they allow, or you can't find a doctor not bought out by the industry, I can rationalize and check the box. Afterall,I don't want my family living a life of hell, or my child posiibly dying and meeting their maker. THANK YOU SO MUCH MR TRUMP FOR YOUR HONESTY, IT IS NICE TO KNOW THAT THE VACCINE MAKERS HAVE NOT PAYED YOU OFF ON THE SUBJECT OF VACCINES & YOUR PERSON VIEWS ABOUT THE REDICULOUS SCHEDULE! MY DAUGHTER, WHO WAS DIAGNOSED W/ AUTISM A FEW MONTHS AFTER HER 3 SHOTS (MMR,VARICELLA,POLIO), DID NOT HAVE AUTSIM BEFORE THEM AT 14 MTHS OLD, 20 MIN AFTER HER SHOTS SHE WAS EXPERIENCING CONFUSSION,HITTING HER HEAD, DIALATION OF THE PUPILS OF HER EYES, OCD, FEBRAL SEIZURES, DAYS LATER STRANGE RASHES, BOWEL ISSUES, HIGH PITCHED SCREAMING, ARCHING HER BACK, ETC. SE IS 7 NOW 7 STILL SUFFERS WITH AUTISM/PANDAS, BOWEL DISORDE, INFLAMMATION, DIALATION OF HER PUPILS(EYES)OFF AND ON THROUGHOUT THE DAY, LITTLE SPEECH (TWO-THREE WORD SENTENCES), FOOD & INVIRONMENTAL ALLERGIES/INTOLLERANCE, OCD, DISBIOTIC GUT FLORA, ETC. Why not just skip the vaccines all together? If you raise a child on a good healthy diet, make sure they get plenty of natural Vit. D from the sun or Vit. D3 as a supplementation, they'll survive whatever may come their way. If the Donald runs for president, he will definitely get my vote. The country will be better for it too. There is just no way to know if any one, or only one, is one too many. I would say the one was likely a three in one unless he personally ordered it for his child. I was told by Merck that even if I was willing to pay that was not possible,but maybe lots of money makes a differance. Trump for President! The man has a brain and he uses it! There is no argument! Shooting neuro toxins into an infants blood stream is dangerous! End of story! This game of russian roulette, I believe, in history mass vaccinations of infants will become known as the mass medical nightmare that it really is. And how sad to be looked on in history as people who had vast amounts of information to warn them against such insanity, and yet were so stupid as to follow the disabling of their own children! Come on people wake up! Well I have sister 36. She was talking and playing normally until she got a dose of vaccine. She stop tlakign and stop smiling and began to be with drawn. Listen, som people romantisize autism. Weel this is horrible! Autism canmean a life long special care. She has been in 20 different facilities. Large one , abuse terribly, small abuse withburns three blacks eyes, and to date 50 brusies all over her body 10 of which are in last year 5vie are in last three onths. She canot talk and gets fustrated adn can get aggressive. She is the perfect candidate for abuse she can not talk yet she does abuse her self by rubing her are and for head, only but being burned by a light bulb, picjhed on breast and brusies on her buttocks and stomack are always blamed on her. My mother died and me and my sister see over her. The care givern in milwaukee are satanic. If only we could have not gotten her vaccinated, I do not get my children vaccinated ( my youngest is ten He had the first series and will not get more, my other son now 26, had a bad reaction to one shot and the doctor said he should not have any more ,considering my family history. Please think twice about pumping your children with so many diseases particles, It can make the brain go hey -wire and stay that way. I cry daily because there seems to be no answer and no cares, We just try and keep in touch as much as possible daily. Its heart breaking and demoralizing. Twins are generally more susceptible to vaccine damage, so whilst it is tragic that you were not better informed before you allowed shots to be given to your nine year old, at least you did become aware then, so if it wasn't for that, you would likely have autistic twins. They are very lucky to be spared these poisonous injections, so it is the vaccinated that are cause for worry, not the unvaccinated, with their more robust health, happier demeanor and higher IQ, as I expect you are observing yourself - they are the lucky ones. As far as getting them into preschool/school goes, the right to security of person, along with the right to an education, are fundamental rights recognised in common law and globally in international treaties, but in practice how much trouble, if any trouble at all, you need to go to in order to have those rights upheld depends on where you are, which you have not revealed. If you go to www.vaccination.inoz.com/rights.html you may find some assistance on that subject. Our nine year old son disappeared before our eyes after his shots. We now have two year old twin boys who we did not vaccinate and they are TYPICAL boys. I worry all the time if we made the correct choice but listening to them speak and watching them play I don't think I can risk watching them slip away too! NOW ....how do I get them into preschool/school? Whilst it is good that Trump is helping overall to publicise the link of vaccination to autism, "brilliant" is not the right word to use to describe him. If Trump was brilliant he would research the whole subject of vaccination, and not be influenced by hearsay or mass propoganda, which he would know that you certainly can't automatically assume to be true when massively powerful financial interests are behind it. A brilliant person would not inject any poisonous substances directly into their child (which prima facie would be reasonably expected to have some harmful effect) unless they have seen solid scientific evidence that it is going to be of benefit, and for some (absurd) reason, can be sure that it is not going to be harmful. Research would have shown him that vaccines increase, not decrease, susceptibility to the diseases they are supposed to prevent. The chances of getting the diseases (unlike the chances of the diseases being reported) are higher and also only the vaccinated can get the new, more serious atypical forms, atypical measles the most documented, which has a death rate of 12-15%. There are also plenty of cases of children becoming autistic from single vaccines, e.g. see www.vaccination.inoz.com/autism.html. In fact with receiving a greater number of injections now, so more poisons being injected overall, his son Baron could even be at an increased risk of autism, and the host of other adverse effects, compared to those just receiving the MMR. When there are any doctors, but particularly plenty of doctors (the majority, according to research that has been done) who, when asked, admit that they choose against vaccines for themselves and/or their own children, he should be asking what they know that he doesn't. A brilliant person assumes nothing and asks everything. i personally would love to know the exact shots given at what times that trump has set up for his child. The science that proves that vaccines injure humans is already on the package inserts found with each vaccine, in the files at the Vaccine Adverse Event Reporting System and on the website at www.nvic.org, the National Vaccine Information Center, run by Barbara Loe Fisher, a parent of a vaccine injured son who is respected enough by the vaccine machine to be a consumer member on their panel. Why is it so difficult for the vast majority of the public to realize that vaccines are just another medical product that could potentially be injurious? You don't think Vioxx should have been recalled? I pray that the non believers are not injured by their flu shots or Gardasil vaccines as they blindly accept their doctors' recommendations for medical treatment (that provides the doctor with profit) without adequately researching the risk benefit ratio of the possible side effects of that decision. We must all come together as a nation to demand more oversight and accountability for all medical products including vaccines to acheive the best level of public health. Plot Outline:The idealist William Wilberforce maneuvers his way through Parliament in 19th century England, endeavoring to end the British transatlantic slave trade. I recommend seeing it. We learn from history so we are not doomed to relive it. William Wilberforce and his associates fought for years to stop the abomination of the slave trade. John Newton: God sometimes does His work with gentle drizzle, not storms. Drip. Drip. Drip. There still is slave trade in various parts of the world but no longer in England, France or the USA. Instead in the USA we have the abomination of mandated vaccines. We are told that we have no alternative to vaccinate our kids but when something goes wrong like adverse reactions causing autism; we are left to deal with it ourselves. We can and should work with God to do his work with gentle drizzle to reclaim our freedom when it comes to this issue of mandated vaccines. God gave us our liberties and no man/government should take that away from us. Donald Trump and his family are one of just thousands, if not millions, who have been reached by the message that the CDC's ever-increasing one-size-fits-all national vaccination schedule is not safe. Countless children will be spared from vaccine damage through spacing out shots, delaying shots, and even skipping some shots. The relentless and work dedicated of parents and professionals, many of whom are on the AOA, has made this situation possible. I didn't open my eyes to the reality of the vaccine-autism connection until 2005, when my son was 4. We were able to benefit from having further damage to his already compromised gatro/immune system because the morning my eyes were opened, we were heading to a "well-child-checkup" where his doctor wanted to give him his MMR and other boosters. That would have been bad. We were also able to benefit from starting on biomedical at a young age. He's made a lot of progress. I thank all of you. "Some" of the extremely wealthy can not be bought off. Sadly, Bill Gates is not in the same camp as Donald Trump. Gates and his corporation- Microsoft have the only private insurance coverage for ABA therapy for their employees- in an attempt to reverse autism, but his Gates foundation is focused on injecting a plethora of vaccines into children in 3rd world countries. Given goal #2, he could save alot of lives if he'd fund some effective and practical research on how to get all these kids with autism well, now that he's funded what contributed to their ill health. One has to wonder if he simply isn't getting the right information, or if he is choosing to turn a blind eye? This just shows that its the extremely wealthy who cannot be bought by Big Pharma and are not afraid to speak their mind. There are others out there that are capable of independent thought but too overcome by greed to express it. We need more people like Donald Trump, how refreshing it is to see someone unafraid of speaking the truth. I do think we are making a difference, its only a matter of time now before its all out in the open. The evil doers should rightfully be squirming after perpetrating this atrocity on the innocent children everywhere. Justice will be served, do you hear? Yes, justice will be served!! !